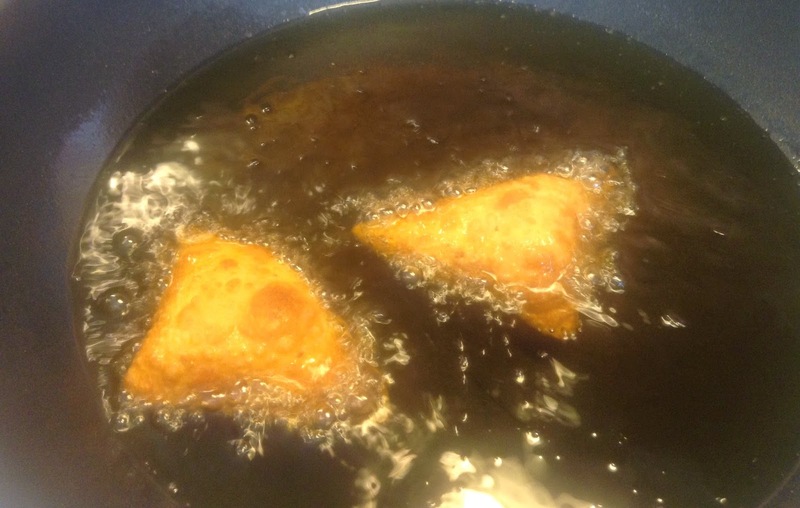 In India, samosas are a national passion; you can find samosas in almost every part of India. They are also a popular street food. 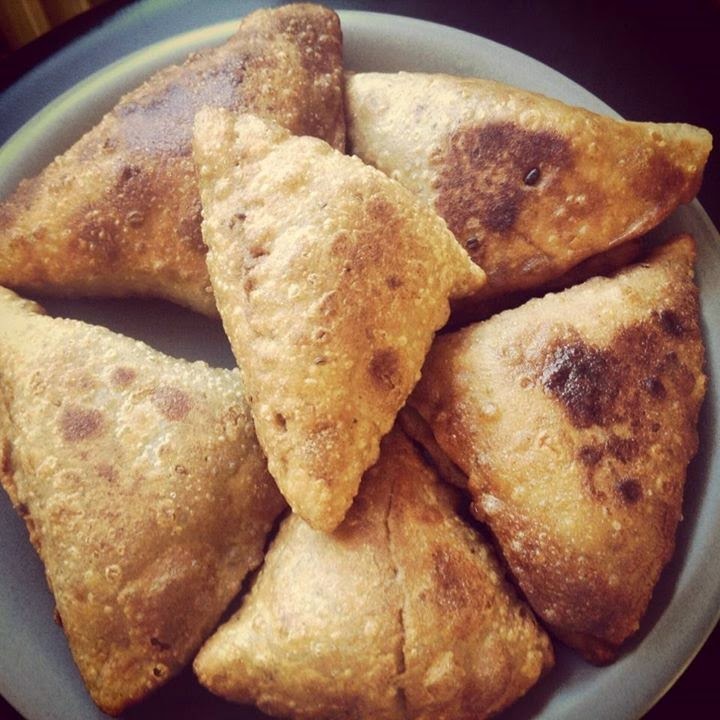 The combination of samosas with hot masala chai, or any chai for that matter of fact is irresistible. We used to get samosas etc. from the sweet shops as breakfast a lot of times, and I have eaten samosas in various parts of Rajasthan, Delhi and Mumbai.. When I moved out of India, this was one snack I used to miss at a lot of times. But I did not want to make them with maida (all purpose flour).. instead I thought probably I could try it with 100% whole wheat flour (the regular atta for making chappatis). Even though it was just an experiment, and I was not even a bit hopeful, I was not aware of the proportions of the dough I must make. So the dough (and also the filling paste) turned out to be way too much. 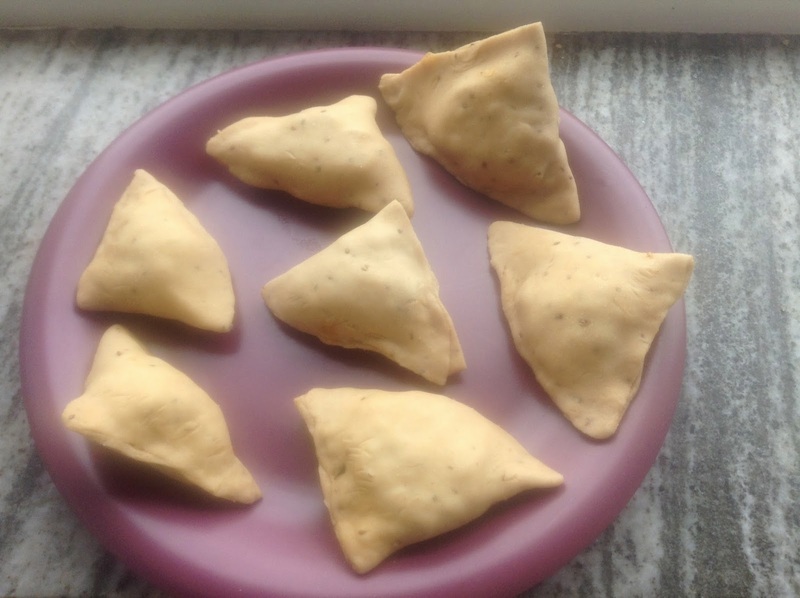 Originally we had planned to make about 3 samosas, which would be enough for both me and my husband.. but I had the material for 6 !! So I decided to go ahead with making all of them.. and to my surprise, they came out simply perfect !! Yes, the crust tasted a bit different, but it tasted no less than the regular samosas. And of course, it was healthy and freshly made at home.. what else do you need for a Sunday morning breakfast with a cup of hot tea. Another very important point.. we could finish all six of them ! Yes, they were that light that we hardly noticed. So unlike the regular samosas we get in India. They were not heavy on the stomach and were easily digested as well.